PODRAS UTILIZAR NUESTRAS BARBACOAS Y MESAS SIN COSTE ALGUNO PARA TI , CON LA UNICA OBLIGACION DE QUE LA BEBIDAQUE CONSUMAS , SEA TODA ADQUIRIDA EN NUESTRO BAR . DISPONEMOS DE BEBIDAS EN TAMAÑOS GRANDES , PARA QUE COMER EN NUESTRO MERENDERO TE SEA MAS BARATO QUE COMER EN TU PROPIA CASA. PUEDES LLAMARNOS AL TELEFONO 942851643 O 680815383 Y RESERVAR MESA Y BARBACOA SIN TENER QUE MADRUGAR Y PODER IR TRANQUILAMENTE A LA PLAYA Y DESPUES VENIRTE A HACERTE LA BARBACOA CON LOS TUYOS . TENEMOS ABIERTO TODO EL AÑO. 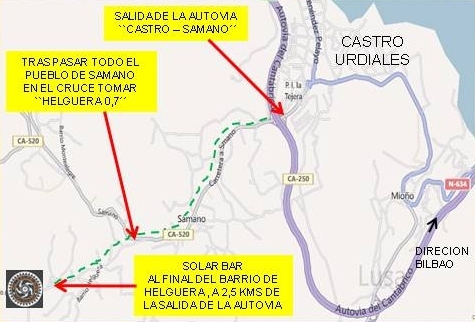 PARA LLEGAR AL SOLAR BAR , SI VIENES POR AUTOPISTA HACIA CASTRO URDIALES ( CANTABRIA ) , DEBERAS TOMAR LA SALIDA QUE INDICA: ``CASTRO URDIALES - SAMANO´´ . UNA VEZ TOMADA LA SALIDA , DEBERAS SEGUIR DIRECION HACIA SAMANO . DESPUES DE DOS KILOMETROS Y PASAR TODO EL PUEBLO DE SAMANO , ENCONTRARAS UN DESVIO HACIA LA IZQUIERDA EN EL QUE PONE UN CARTEL CON : ``HELGUERA 0,7´´ . LO TOMAS Y TRAS KILOMETRO Y MEDIO LLEGARAS AL FINAL DEL BARRIO AL SOLAR BAR .